Posted by Mrs Weird Scientist in Easy As Pie, Environment. Being your own (have a go) architect is a lot of fun and allows you to create and enjoy something which is part of yourself and the land rather than, at worst, a mass produced box designed for maximum profit and convenience of the construction industry. Building from natural materials does away with producers profits and the cocktail of carcinogenic poisons that fill most modern buildings. The home took approximately four months to build and required an estimated cost of £3000 ($6000 Cdn) and 1500 man hours. The aim of the project was to build a house while simultaneously respecting nature and using natural materials. The house was built with attention to an underlying motto from Simon, which is that anything a person could possibly need will be found somewhere in a pile of garbage. The floors were made from reclaimed wood and the fridge keeps cool because of air that flows underground through the foundations. A massive skylight in the roof keeps the home brightly lit during the day, without the need for electricity. If you’re like me, you were also maybe wondering about the bathroom? Well, it really is back to nature for this one! The house has a compost toilet. What about those gadgets like your computer? To provide energy, the house uses solar panels for lighting, music and computing. But how does the family deal with the icy Welsh winters? Given that I’m currently living in Cardiff, Wales – I know all too well about the freezing winters! That’s where the wood-burning stove comes in, allowing the family to obtain heating that is renewable and abundant. Oh, and by the way I am not a builder or carpenter, my experience is only having a go at one similar house two years before and a bit of mucking around in between. This kind of building is accessible to anyone. My main relevant skills were being able bodied, having self belief, perseverance and a mate or two to give a lift now and again. Now that is a super fabulous example of doing something different and challenging. Not only does the home preserve the surrounding environment, but it also sets a cool example to others by showing how we can all find positive ways to impact our environment. Posted by Mrs Weird Scientist in Environment, Technology, Weird Gadgets. We’re lucky here on our earth. Why? Because we have heaps of different materials that allow us to build and create almost anything our minds can conjure up! Ever wondered how we’d fare if our wasteful ways left us with only a handful of materials? Marco Facciola, a 16 year-old high school student in the International Baccalaureate program, was required to complete a project on a non-academic topic. 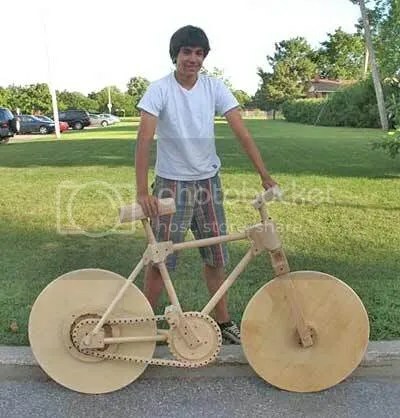 As he was reflecting on a story his grandfather told – when rubber was scarce during the war and his grandfather needed wheels for a bicycle – Marco thought about building a functional wooden bicycle. The full, original article can be read here. I could not sharpen the bits I was using because they were Forstner drill bits. So, to prevent them from overheating and dulling, I drilled only a little at a time. I would remove the bit from the partially drilled hole and while it was still turning, I would take a bar of soap and rub it against its side to reduce the friction in the hole. This also cooled the bit slightly. Having enjoyed woodworking and design for a long time, Marco plans to challenge himself with future projects. For now though, he is going to focus on school, his job and sports. I think that Marco’s project shows how an open mind and hard work can allow a person to build with only one material instead of the many different materials usually required. At the same time, the project was a challenging and time-consuming one. It demonstrates how important and valuable it is to have a wide range of materials to use for building and creating the items we use in our lives. If you’re not getting my hint there, I’ll say it more clearly! Reduce, reuse and recycle!